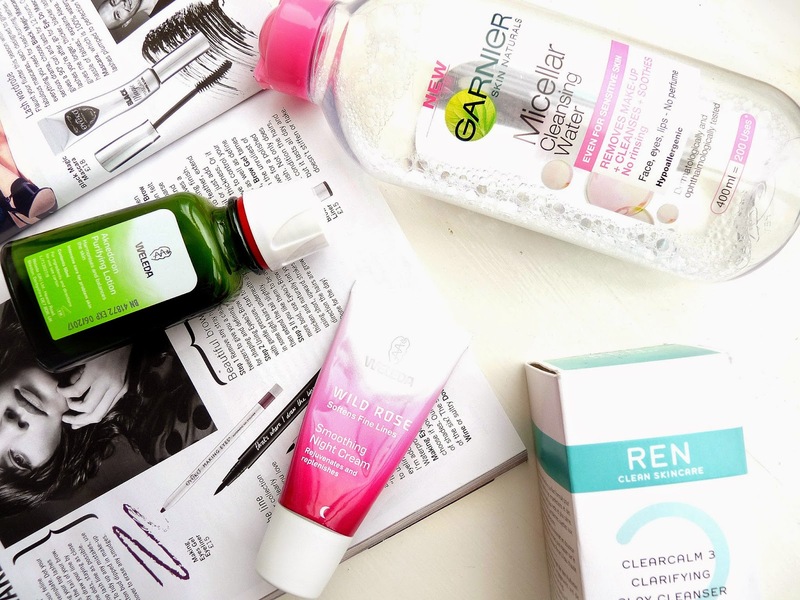 Skincare has always been one of my favourite content topics to read about on blogs and in magazines and a title that always intrigues me whilst browsing blogs is 'My Skincare Routine'. I've been wanting to write my own version for quite some time now but as my skin has been playing havoc on me I've not actually been 100% happy with my skincare routine until recently. My favourite skincare ritual at the moment is my evening one; all the products I've been using in it recently my skin has been absolutely loving and I definitely won't be changing this routine for a while now as it's taken me so long to finally find one that works well for me. In my evening skincare routine I only use four products, which in comparison to some other people's routine does not seem like a lot, but for sensitive, blemish prone skin like mine I feel like less is definitely more. It's really just down to personal preference and how you skin behaves, everyone's skin is different after all, but I've found that using the bare minimum of products leaves my skin feeling and looking better than using lots. Taking all your make-up off at the end of the day is such an important thing to do, anyone will tell you. At the start of my evening skincare routine I like to take off all my make-up, including my eye make-up with Garnier's Micellar Water. Since jumping on the micellar water bandwagon I've not looked back and I most definitely wouldn't touch make-up wipes ever again. Micellar waters are meant to remove make-up more efficiently and after using it myself I can definitely tell the difference. I usually find that wipes, even the sensitive skin ones, are also quite rough on my skin especially my eyes and micellar water is such a nice, soothing and more beneficial alternative. I'm now on my second bottle of Garnier's micellar water but I've previously used L'Oreal's which I found equally as good. They both have the same ingredients and literally do the same thing, but you just get more for your money with the Garnier one, that's pretty much the only reason I use it over L'Oreal. After removing all my make-up, the next step of my evening skincare routine is a second, deep cleanse to really rid my skin of impurities and, you know, cleanse it thoroughly. I'm just coming to the end of my first bottle of REN Clarifying Clay Cleanser and it's definitely a product that I will be buying again (and again). REN pride themselves in providing clean, natural skincare free of parabens, mineral oil, sulfates and many other nasty ingredients that can be found lurking in beauty products and I've been raving about their Clay Cleanser recently. Any girl with oily skin will know what I mean when I say that clay products are a god send and this is actually the first clay product I've used that's a cleanser, but I absolutely love it. It leaves my skin feeling deeply cleansed and revitalized, and is one I'd recommend to anyone who is blemish prone or oily skinned. Even if you don't have that skin type, check out REN as a brand, I've fallen so hard in love with this product and I can imagine a lot of their products will impress me just as much; I can't wait to find out! Currently in my treatment step I am using Weleda's Purifying Lotion, which I will interchange with Triology's Rosehip Oil once or twice a week, but for the most part I use this gorgeous Weleda lotion. My skin will never, ever be flawless, but I'm really happy to say that since using this (and having this skincare routine as a whole), I haven't had a single blemish on either of my cheeks. If you're a long term follower of mine you'll know that back in the spring I started getting angry spots on my cheeks that wouldn't budge, no matter what I did or used. These spots have only completely disappeared in the last month or so which I'm literally over the moon about as they seemed like they would never go. I've still got a few spots popping up on my chin and forehead but they go after a short (well, short in comparison to my cheek blemishes) while so I finally feel like my skin has recovered from that which is AMAZING. Fingers crossed that it can now only get better and I feel like this lotion is really helping my skin on it's way to being less prone to angry, long-lasting blemishes. I use another Weleda beauty as my night cream, and holy moly, is this a good one. I mentioned Weleda's Wild Rose Night Cream briefly in my October Favourites post and I'm still loving the results that I've been getting from it. This gorgeous night cream sinks deeply into my skin of an evening leaving it feeling super soft, soothed and generally amazingly pampered. I've really noticed a change in the appearance of my skin too waking up as it's no longer dull and grey, but radiant and soft which it literally never is in the mornings so that's such a pleasant change which I'm definitely not tired of in the slightest! That's the end of my evening skincare routine; short but very sweet on my skin. As I mentioned the blemishes on my cheeks have finally disappeared (hallelujah!) and I think these products have been a factor in this. I'm also slowly transitioning to all natural skincare products which I think my skin definitely feels better for too, so that's something I'd definitely recommend people to try if they're having problems with their skin which you can't seem to find a solution for. I hope you enjoyed this post and I'd love to read your skincare routine posts too, so comment with a link below! I need to update my evening skin routine so I'll be on the look out for some of these products. I love the garnier micellar water! definitely need to give Weleda's purifying lotion as I would love to get rid of some of these blemishes that just refuse to go! do you use any other products to treat spots or blemishes? It fascinates me just HOW MANY options there are for skincare. Thanks for lowering the bafflement a little! fab post! you've got some lovely skincare products here! Love it! Not such a skincare girl, though! I am thinking about starting a face care routine. I don't wear make up so I wouldn't need to use the micellar water, but I have tried some of the la roche posey cleansing and moisturizing products. I think they are about £15 here in Canada. I find my skin gets really dry and unpleasant. So glad you wrote this post. It has prompted me to go start one.